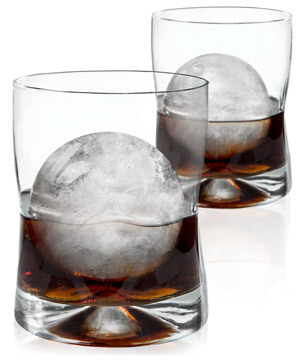 Enjoy your classic cocktails with sophisticated ice balls thanks to Sphere Ice Molds. These slow-melting spheres keep your drink chilled for extended periods of time without diluting your beverage. Each best-in-class mold was designed for durability and convenience. 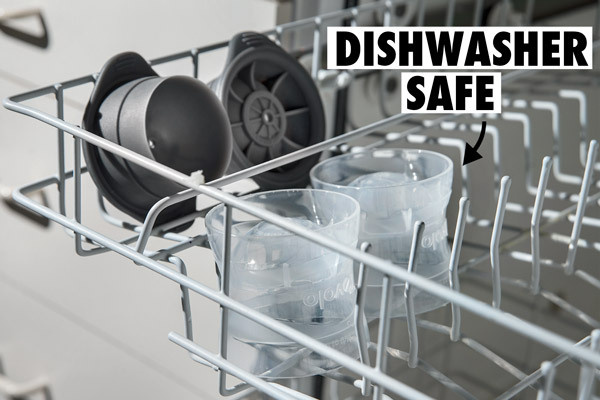 A concave silicone lid eliminates leaks, and its flat plastic bottom allows them to be stacked in the freezer without any chance of tipping over. Create 2.5-inch spherical ice "cubes" with Sphere Ice Molds. Sold as a 2-pack. Enjoy slow-melting cocktail spheres at home! We like big ice cubes at Vat19. They look awesome and they melt far slower than an equivalent volume of smaller cubes. In fact, the sphere has the most advantageous surface-area-to-volume ratio of any geometric shape! This mathematical concept is important because it means your tasty beverages will stay colder for longer — and they'll taste better! The slower the ice ball melts, the less diluted your fancy whiskey will taste. 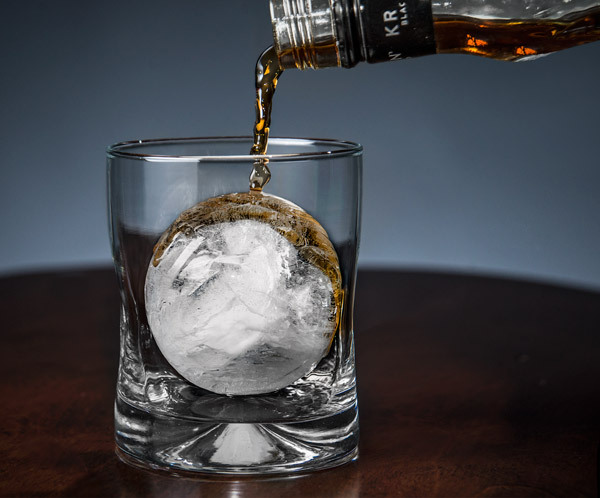 Add perfectly formed sophistication to any drink with Sphere Ice Molds. Our Sphere Ice Molds are hassle-free and guaranteed to create perfect spheres every time. Here's how easy it is to create spherical elegance: Start by filling the molds with water to the indicated line. Next, gently lower the silicone cap onto the mold. Finally, freeze the mold for 4-6 hours. As you press the cap onto the mold, any excess water is caught in the cap. Sphere Ice Molds won't tip or leak in the freezer! Share your classy cocktails with a friend! 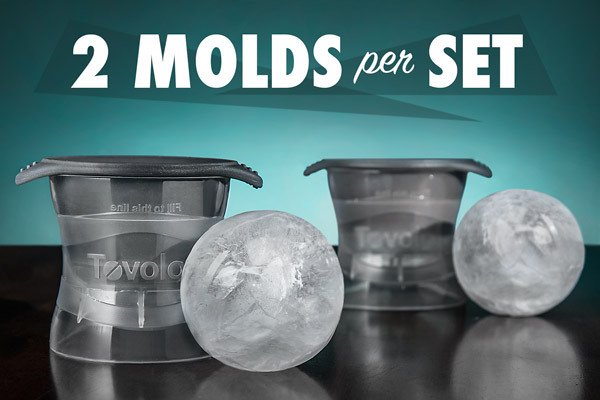 Each set of Sphere Ice Molds includes two ice-ball-making molds. So, we suggest inviting over a friend, but because we're huge supporters of efficiency (and a good time! ), we applaud your making yourself two drinks at a time. These ice balls will last so long, you won't have to rush through your first drink! Stackable Sphere Ice Molds are sold in pairs. Should you accidentally drop your Sphere Ice Mold into a horn of kräuterlikör, don't freak out. These elegant ice-ballers are dishwasher safe! Dirty Sphere Ice Molds? They're a rinse in the dishwasher away from being squeaky clean again! Question: How big of an ice sphere does it make? Answer: The Sphere Ice Mold makes 2.5-inch diameter ice balls. They will fit into most any low ball glass. Our internet sleuthing determined that most low ball glasses have a diameter of 3" to 3.25". Question: Will it fit into Vat19's curiously awesome whiskey glasses? Answer: Oh, you mean these wobbling glasses? Why yes, they will fit! Thank you for asking. Question: I've used other ice ball makers that were difficult to use or tipped over in the freezer. Will your Sphere Ice Molds fill me with rage? 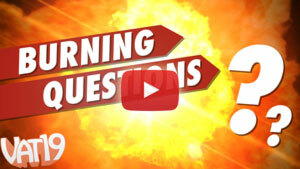 Answer: We certainly hope not! Our Sphere Ice Molds were designed to be stackable, so they're not going to tip over in the freezer. Their silicone cap makes it easy to remove the frozen ball and its concave lid prevents spills. Sphere Ice Molds work well. You will not be disappointed!